WITH HIS DEBUT RELEASE MOUNTAIN BLACK (AKA MARTIN KAY) CREATES A DENSE FILMATIC AMBIENT BODY OF WORK. THOUGH ROOTED IN PHONOGRAPHY THE ALBUM REPRESENTS AN ELECTROACOUSTIC SOUNDTRACK, MUCH MORE CLOSELY RESEMBLING PIECES OF NOISE AND DRONE MUSIC THAN TRADITIONAL PHONOGRAPHIC ART. THE ALBUM IS COMPRISED OF ENVIROMENTAL FIELD RECORDINGS, FOUND SOUNDS AND ABSTRACTED INSTRUMENTATION WHICH HAS BEEN SCULPTED, CRAFTED AND COMPOSED USING CROSS-SYNTHESIS PROCESSING TECHNIQUES AND DIGITAL EDITING PROGRAMS. K” - PARTICULARLY ITS’ UNIQUE ABILITY TO SCULPT AND WEAVE TOGETHER DISPARATE SONIC ELEMENTS - SUCH AS, MUSIC, FOLEY, ATMOS ETC, AS WELL AS ENVIRONMENTAL, CONCRETE, ABSTRACT AND SYNTHESIZED SOUNDS TO FORM A COHESIVE SONIC COMPOSITION. BY APPLYING COMPOSITIONAL METHODOLOGIES AND APPROACHES WITHIN THE SOUNDTRACK TO HIS OWN MUSIC MOUNTAIN BLACK IS EXPERIMENTING WITH THE CONCEPT OF HOW THESE INHERENTLY CINEMATIC DECISIONS AND TECHNIQUES TRANSLATE TO A MORE MUSICAL CONTEXT - DIVORCED FROM ANY VISUAL REFERENCE OR CONCRETE NARRATIVE. IT’S NOT SO DIFFICULT TO REALIZE THAT MELBOURNE-BASED SOUND ARTIST AND SOUND DESIGNER MARTIN KAY IN THE GUISE OF MOUNTAIN BLACK KNOWS MANY FICTIONAL TOOLS WHICH BELONGS TO MOVIE SOUNDTRACKS AND NARRATIONS IN GENERAL, BUT THE LACK OF PRECISE SPACE AND TIME HANDHOLD AND VISUAL REFERENCES SUBTEND THE INTENT OF REMOVE ANY NARRATIVE PLOT FROM ITS SONIC ART, WHICH STANDS ON AN AMALGAMATION OF PROCESSED FOUND SOUNDS, FIELD RECORDINGS AND DRONE BY MEANS OF CROSS-SYNTHESIS PROCESSING TECHNIQUES AND DIGITAL EDITING PROGRAMS. SUCH A CHOICE COULD FLOOR MANY FOLLOWERS OF THIS BRANCH OF SONIC EXPERIMENTS SINCE MANY SOUND ARTISTS WHO DEAL WITH FIELD RECORDINGS ARE TRYING TO RENDER A SORT OF NARRATIVE LINE OR LET THEIR ARTS MOVE WITHIN THE FENCES OF CONCEPTUAL FRAMEWORKS AT LEAST, SO THAT THIS PURGE BY MARTIN COULD BE THE BEST INVITATION TO SHARPEN EARS AS IF THEY GOT OUTFITTED BY POWERFUL RECEPTORS WHICH CAN GRAB THE SLIGHTEST VIBRATIONS OF RESOUNDING PARTICLES. HOWEVER MANY LISTENERS COULD FALL INTO TEMPTATION OF BUILDING A SORT OF NARRATION DUE TO THE SONIC CLUES THAT MARTIN KAY’S ASTONISHING SOUND MODELLING AND THE INTERCEPTIONS OF HIS CONTACT MICS PROVIDE SUCH AS THE INTRIGUING DICHOTOMY BETWEEN “DIEGETIC” AND “NON-DIEGETIC”, A COUPLE OF TRACKS WHICH REFERS TO THE ROLE OF SOUNDS IN FILMS: WHEN A CHARACTER OF THE MOVIE OR A FICTION IN GENERAL CAN LISTEN SOUNDS, YOU CAN SAY THAT SOUND IS DIEGETIC, WHILE ON THE OTHER HAND WHEN THE SOUND (FOR INSTANCE SOUNDTRACK ITSELF) CANNOT BE HEARD BY THE CHARACTER, IT IS TERMED NON DIEGETIC OR EXTRA-DIEGETIC. MOUNTAIN BLACK’S TRANSLATION OF THIS CONCEPTS IS ABSOLUTELLY INTERESTING: WHILE “DIEGETIC” FEATURES THE “USUAL” WELL-RECORDED INSECTS, BIRDS, BURNING PYRES AND OTHER ALMOST IMPERCEPTIBLES SONIC ELEMENTS THAT THE “STORYTELLER” CAN LISTEN, “NON-DIEGETIC” SEEMS TO HAVE BEEN RECORDED WHILE THE KEY PLAYER FALLS IN A LIGHT AND DISTURBED SLEEP WHILE WATCHING TV. THE ABOVE-MENTIONED TEMPTATION COULD BE FED BY SOME LOGICAL AND SONIC CHAINS AS WELL, SUCH AS IT HAPPENS FOR THE TWO PARTS OF “GLASS EATERS” (A SONIC TRANSLATION OF HYALOPHAGIA? ), THE TWO DETACHED SONIC INPUTS OF “WAITING ROOM” (A DISTANT VOCAL NOISE AND A WHITE SQUALL), WHICH FLOW INTO THE FOLLOWING “MESSIN”, AND THE ALMOST SILENT “BIND”, WHICH SEEMS TO BE A SORT OF PREFACE OF “NON-DIEGETIC”, BUT ANY CHANCE OF NARRATIVE COHESION CANNOT BE BUT DELEGATED TO THE IMAGINATION OF LISTENERS. I RECOMMEND A CLOSER LOOK (AND A CLOSER LISTEN) TO MOUNTAIN BLACK’S WEBSITE IN ORDER TO UNDERSTAND BOTH AESTHETICS AND “POETICS” AS WELL. FROM A SEEMINGLY ENDLESS SILENCE SLOWLY EMERGES A SOUND… A TECTONIC RUMBLE AND A SCRAPE, FOLLOWED BY A SUBTERRANEAN DETONATION, AND THEN… NOTHING. A STILLNESS. THE OCCASIONAL FLUTTER AND TWEET FLICKERS THROUGH THE SILENCE, EPHEMERAL EVENTS IN A WIDE OPEN SONIC SPACE. CRACKLING SOUNDS AND HEAVY RAIN UNEXPECTEDLY FLOOD THE SENSES BEFORE FADING OUT ONCE MORE, LEAVING THE LISTENER ALONE ONCE MORE IN A DESERT OF SOUND AND EQUALLY, AN ABSENCE OF SOUND. 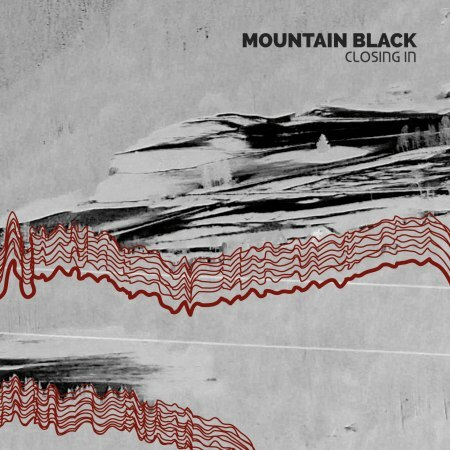 IT’S THIS ABSENCE, THIS LACK, THAT ESSENTIALLY DEFINES ‘CLOSING IN’, AS MOUNTAIN BLACK EXPLORES THE EXTENSIVE SPACE BETWEEN THE SOUNDS, AND INHABITS THEM. IN A WORLD THAT’S CROWDED WITH NOISE, ‘CLOSING IN’ COMES AS A SURPRISE. IN THIS CONTEXT, IT’S A DARING PIECE THAT IN BARELY MAKING A SOUND, DEMANDS THE LISTENER’S ATTENTION. For sixty seconds, Closing In is a pure, bucolic field recording: wind, birds, passing traffic. But at 1:01, odder sounds enter the mix, sounding like a splice of thunder and train; and only 37 seconds later, they disappear, replaced by footsteps and the voices of a man and child in a tunnel. What is going on here? Premier album de Martin Kay, sous le pseudo Mountain Black, tout frais paru. Kay est un électroacousticien et un phonographiste. Closing In est un peu des deux, mais ni tout à fait l’un ou l’autre. C’est à dire que, même si la musique a pour matière première des enregistrements de terrain, nous sommes loin de la phonographie pure. Et si l’approche est électroacoustique, le résultat a peu à voir avec la version universitaire du genre. Parce que Kay insuffle à sa musique une bonne dose de drone. Closing In est un disque sombre, mais pas opaque, et il invite à une écoute immersive, même si ce qu’il propose incite plutôt à la claustrophobie. The debut album from Mountain Black, aka Martin Kay, just out. Kay is an electroacoustician and a phonographer. And Closing In is a bit of both, though not quite either. What I mean is that, though the music is based on field recordings, this is far from pure phonography. And though Kay’s approach is clearly informed by electroacoustics, it has little to do with the academic form of that genre. Because there is a strong drone component to Kay’s work. Closing In is a dark record, but it is not opaque, and it calls for an immersive listen, even though what it has to offer can feel claustrophobic at times.THE SOUND PRJECTORMountain Black is Martin Kay, an Australian sound artist based in Melbourne, specialising in sound art, field recordings, compositions, installations, and soundtrack work. On Closing In (MOOZAK MZK#006) we’ve got a very subtle blend of slow-moving sound episodes, where the edges between field recordings and (electronically-generated?) ambient sounds are continually blurred and confused. He has no interest in site-specific recordings as far as we can tell, unless naming a track ‘Singapore’ qualifies as identifying a particular locale. Though there are 10 index points on the album, this feels like it might work when played back as a start-to-finish suite of near-imperceptible sonic musings. Kay does get briefly agitated about halfway through ‘Non-Diegetic’, and ‘Glass Eaters Part II’ contains its share of thunder-cloud massing droney drama. The most eventful cut is ‘Silver’, just 2 and a half minutes of mysterious burbling intercut with untraceable sound sources, following a wistful dream logic. Quite nice. But for the most part this chilly material is opaque, inscrutable, mysterious.From August 2013. Die Berge erfreuen sich allseits großer Beliebtheit, sogar als Bandname ist der Berg an sich eine Großmacht. Es gibt die Mountain Goats, die Black Mountains, die Mountains (ohne sonst etwas) und eben auch Mountain Black. Aber während die ersten beiden Bands eher im Indierock anzusiedeln sind, machen die in Chicago beheimateten Mountains astreinen Ambient. Der Australier Martin Kay wiederum, das alleinschaffende Mastermind hinter Black Mountain, geht noch eine Spur mehr in Richtung Noise und Drone und field recordings - kurz: in Richtung experimenteller Musik, wobei Kay einen sehr filmischen Zugang verfolgt. Es geht nicht ums Verstören oder Aufbrechen, sondern ums Versinken und Vertiefen, um ein »Closing in« eben, ein Näherkommen in den Sound bzw. die Soundtiefe. Einmal mehr waten wir über weite Strecken durch die vielzitierten »seas of sound« und ihre »inerrant sonic beauty and complexity«, wie die Pressemitteilung erklärt. Es geht Kay allerdings stets auch um ein Ausloten der Stille, um ein Aufspüren von nahezu unhörbaren Soundeigenschaften und -details. »Closing in« wirkt daher über weite Strecken wie der Soundtrack zu einem düsteren Alienintruder-Film, der ausschließlich in Tunnelröhren spielt und wo andauernd die Erde bebt, vibriert oder zumindest ein Güterzug vorüberrattert. Das alles ist natürlich nicht atemberaubend neu, aber doch in einem sehr stimmigen, überzeugenden Sounddesign dargeboten. MOUNTAIN BLACK DID A FINE JOB. IT’S MADE WITH SOME MIGHTY FINE EAR TO THE GROUND OF SOUND SCAPE PRODUCTIONS. THE „CLOSING IN” IS VERY DENSE MATERIAL THAT HAS BEEN CLASSIFIED AS FILMATIC AMBIENT. MARTIN KAY IS NOT TRYING TO BUILD ANY PARTICULAR NARRATIVE OR SEQUENCE OF EVENTS WITH FIELD RECORDINGS. THE CREATION OF „CLOSING IN” WAS INSPIRED BY THE SONIC DECONSTRUCTION OF PLACES HE ENCOUNTERED, IN ORDER TO CREATE THE ABSTRACT AND DARK IMAGE OF THE BLACK MOUNTAIN. EIN KLEINER SOUNDTRACK FÜR EINEN DOKUMENTARFILM OHNE BILDER. DÜSTER.